January 19: Well, I really have nothing more about Europe to post. 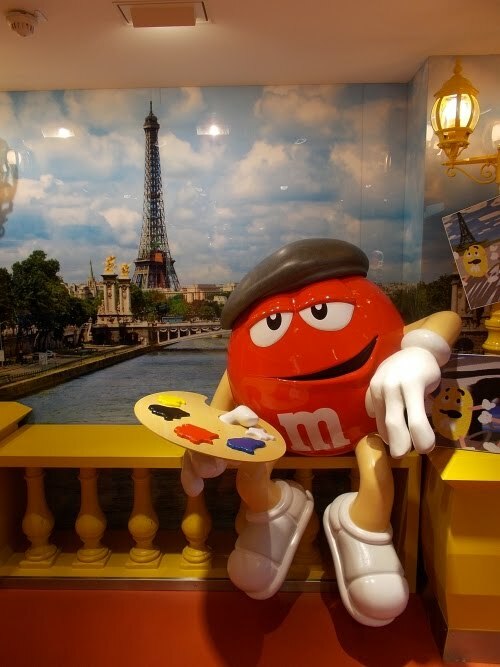 I spent the night in the Paris airport, then another night in Phoenix after missing the last connection of the day to my mom's house in San Luis Obispo. I visited for a few days before flying back to Seattle where I went home for the first time in seven months. Seven months. What an adventure! 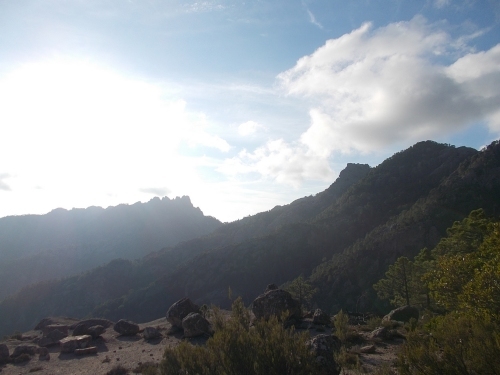 So much had happened in those seven months, with thousands of miles of trails under my feet. I made a spectacle of myself with this dive! I was surprised to learn in... November, I think it was, that my mom was planning to retire at the end of the year. Earlier than she initially intended, but it meant it was time for me to fulfill a promise I had made her that I'd take her to Disney World after she retired. She'd never been there before. She's been to Disneyland often enough being a native Californian and all, but Disney World is... well, another world! But it's a big place, and requires a whole day just to travel there, and another day to travel back and a quality visit was going to take some time. So I told her years ago that when she retired, I'd take her to Disney World. Although I had told her if she retired in July or something, we'd wait until winter to go. Who wants to go to Disney World when the weather is hot and miserable and the crowds can make you claustrophobic? Apparently almost everyone.... except us! 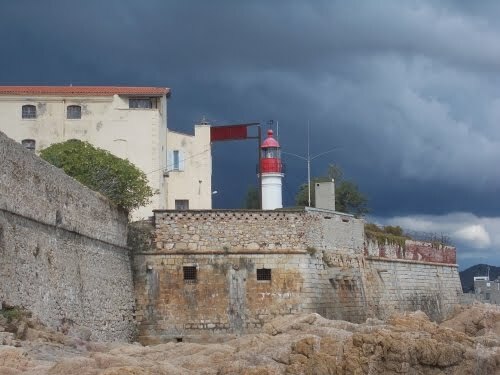 =) We'd go in the off season and when the weather is better suited to our temperament. She's retired. I have a flexible job. We were going to be flexible. 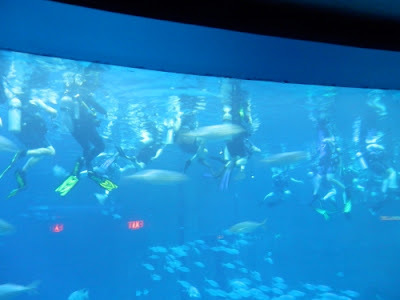 But this time, I did something that was really cool and many of you experienced Disney World visitors might not even realize was an option.... swimming with sharks! 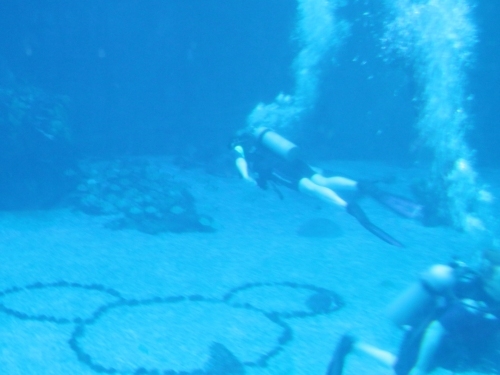 So that's what I'm going to tell you about: The Epcot DiveQuest program. All of the photos and videos were taken by Amanda or my mom. Obviously, I was unable to take any myself! =) This is everyone in the group splashing down before we submerged. I'm in there somewhere, but I'd be hard pressed to tell you which person is actually me. My dive time was scheduled for January 19th at 4:30 or something in the afternoon, so I left Amanda and my mom who were inside the park and went just outside the front entrance, off to the side where the divers were supposed to meet. At this point, we were under strict orders to take no photos--which is why you'll see no photos of this stuff. Backstage stuff is secret stuff. They'll kill you or something if you try to take a photo. Or maybe feed you to their sharks. I'm not sure. I didn't want to get kicked out of the park until after the dive was over, at the very least, so I refrained from taking photos. We could see cranes that they used to put their large animals in and out of the tank, and another smaller tank off to the side that's used to quarantine new animals before they're introduced into the larger tank. 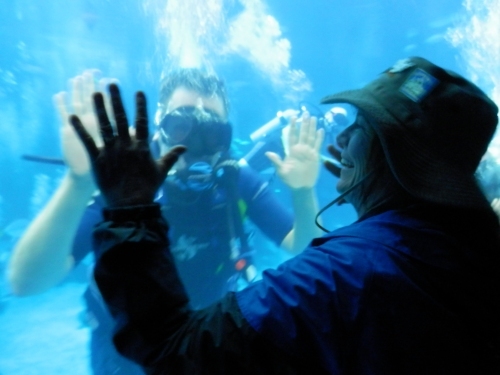 There was also someone onsite, 24/7 every day of the year to make sure the aquarium always functioned properly. Heaven forbid if nobody was around and something important broke in the middle of the night and they arrived the next morning to find all of the animals in the aquarium dead! Needless to say, they also and backup generators to power the place. And we all submerged, just before the obligatory lap around the pool. Then we headed indoors, into the building housing the aquarium, although still in the backstage area where regular visitors never get to go. Our guide, Kate from New Jersey, showed us around a bit. We saw the kitchen where they prepare the food for the animals, and the backstage area where a couple of manatees were floating around. There's a small lift there that can pick up the manatees out of the water when it's time for a vet checkup or some surgical procedure. I thought it was interesting that they always feed the manatees at that location to make them habituated to going there on a daily basis. Most of the time they feed and leave, but when it's time for a checkup, the manatee is already positioned by the lift and gets lifted right out of the water. I imagine it must be startling to the giant creatures the first time that happens, but it's probably easier than trying to herd the manatee to the correct location every time they want a closer look at it. Eventually we were led to a small room where the rules of the dive were explained. I don't know if the room has an official name, but I'm calling it the "briefing room." We weren't to touch any animals. Absolutely forbidden from touching them. It wasn't a big deal if one of them bumped into us, but we were not to touch them. Also, although the coral in the aquarium was entirely fake, we weren't supposed to touch that either. Coral--real corals, that is--are very sensitive and brittle and shouldn't be touched. Although the corals here were fake, not all of the visitors who would see us diving would know that and they wanted us to set a good example, so no touching the fake coral. While we were diving, we would be the attraction for all of the visitors. Not the fish or turtles or sharks. Us. We would be positive superstars underwater as all of the visitors watched. And we had to set a good example. 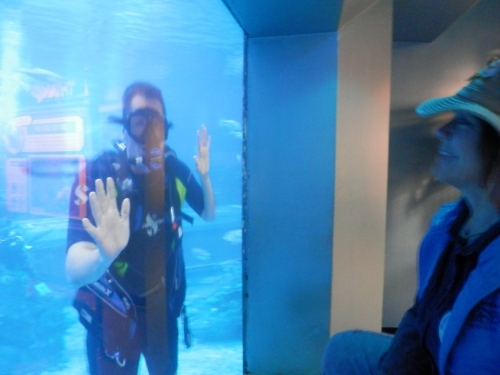 We were, however, allowed to touch the glass of the aquarium, where friends and family could watch us. And the floor of the aquarium was okay to touch or stand on. Absolutely nothing metal was allowed in the tank. No watches, no hair thingys on the women if it used a metal clasp, etc. Metal and salt water did not mix. Also, along one section, there were metal bars separating the dolphins from the rest of the tank. We were to keep at least 10 feet away from those bars. The dolphins, they said, were curious creatures and might try checking us out, but they didn't want them getting too familiar with people. We could look--just don't get too close to the bars. We were also told when we first jumped in, to first hang out at the surface. Once everyone was in the water, the dive leaders would take us on a short, circular swim around the aquarium mostly for the benefit of a cameraman that would be filming us. 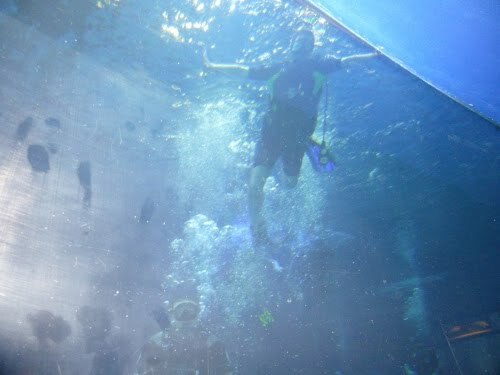 Once that was done, we were allowed to swim pretty much anywhere we wanted, or look for friends and family who might be watching through the aquarium glass. In all, we'd have something like 40 minutes of dive time. With all of the rules done, they eventually led to to some locker rooms where we were all given wet suits to change into. There were only a few women in our group--most of us were men. It was pretty crowded in the men's locker room, but I imagined the women had a lot more space to spread out! Our personal items we could put in a small locker, but we had to give them the key for the lockers before we dived. The key was made of medal and medal is not allowed at all in their tanks. But they'd keep the keys safe until after the dive was done. Once again in the backstage area, we went up some stairs that led to the top of the aquarium--a huge, round pool of water. It was surprisingly large. Inside where visitors are, a lot of the size is hidden because the water surrounds you on all sides and divided into what looks like separate rooms. Standing above it, you could see nearly the entire pool as being in a single, giant room. 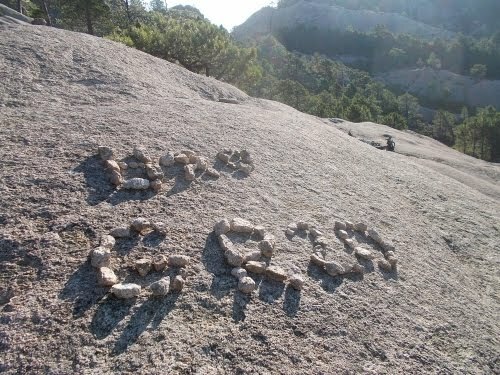 It looked a lot bigger from up here! Tanks and regulators and all that were all lined up and ready to go. They listed us off by name in a specific order--the weights and sizes and such were different each of us, so they needed us to line us in the order the gear was sorted. We put on all the stuff. It had been so long since I had handled any of it, I kind of watched what other people were doing. Put that on first, tighten that strap.... etc, etc. When everything seemed in order, I jumped into the water with a few other people who had already done so. I put the regulator in my mouth and took a couple of gulps of air. It's a weird feeling the first time you do that. It doesn't feel all that natural. But it seemed okay, so then I stuck my face underwater and took a couple of more gulps of air. Okay, that seemed to be going well. 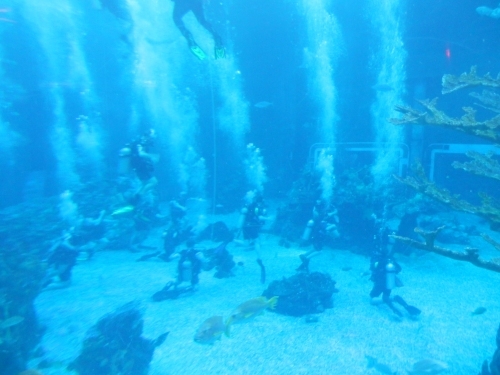 Through the googles, I saw my first view of the aquarium from inside the aquarium. There wasn't much to see. The animals weren't swimming near the surface, after all. I treaded water while everyone else finished getting their gear on and jump into the water, and eventually everyone was ready. We add sank into the water and followed our leader for a promotional circuit around the aquarium. Once I descended a short ways, WOW! So many fish and stuff! And the giant glass walls of the aquarium was filled with what seemed like hundreds of people. A passing thought rolled through my head. This is what it feels like to be in a zoo. Everyone is watching us--right now! I waved from a distance and quickly completed the obligatory lap around the aquarium. There were fish and turtles and even sharks. Sharks! I figured they had to be friendly sharks, though. I couldn't imagine that Disney would let us swim with actual man-eating sharks. Imagine the headlines: "Group of 20 people attacked by sharks at Disney World as dozens of children and parents watch. 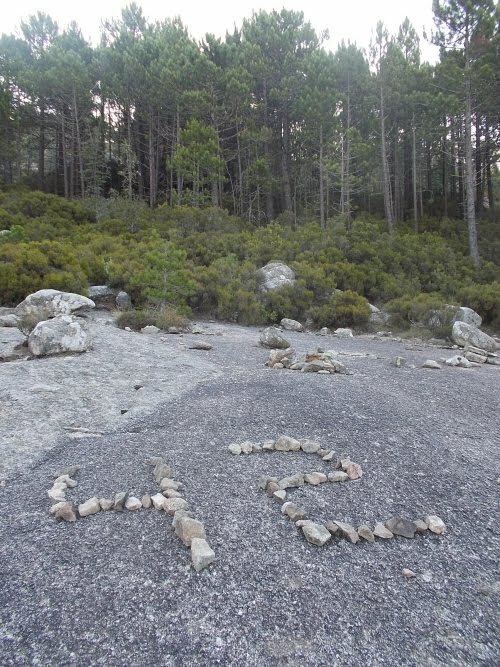 Live at eleven!" But I didn't linger to get better looks at them. As soon as the obligatory lap was over, I swam over to my mom and Amanda as we tried to communicate through the glass and water. Which mostly just consisted of waving at each other, and touching the glass. Options were limited! Most of the divers seemed to have found their family members and were doing the same. Eventually I moved on--I couldn't just stare at them the whole time I was underwater. I would like to see some of the aquatic creatures closer up! The main, large windows had large crowds of people watching us, but there was another window without the crowds. It was a restaurant, where people were eating dinner. The patrons of the establishment couldn't help but watch us either, even if the windows were less crowded with people. Just to be funny, I pointed to one person's plate of food and gave him a thumbs up. 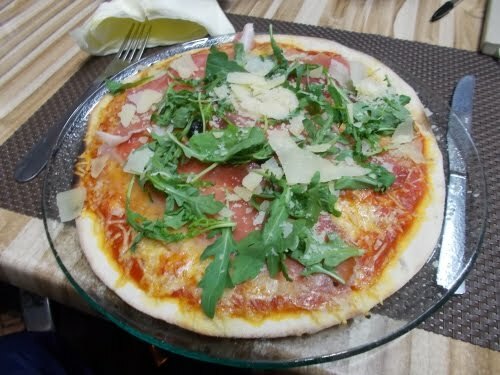 This food was approved by me. I really hoped none of it was seafood, though! That would just be wrong, to be eating seafood in full view of the aquarium. What if the fish was a friend or relative of one of the fish inside?! I took a look around for awhile, but there's really only so much to see, and I wandered back towards the window with all of the spectators. 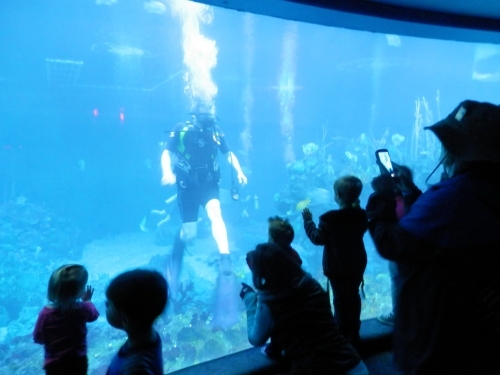 The kids seemed absolutely entranced by our being in the tank, and even though I didn't know any of the kids, it seemed like they would all wave excitedly if I got near them. I waved back. One kid, as I started swimming away, gave me a "come back" wave, so I did, giving him a "what?" shrug. He just looked at me, and I waved goodbye again. Portals to the air-breathing world were everywhere! But I couldn't get through any of them for obvious reasons. Another small boy I could see through the window had a "happy birthday" button on his shirt. I recognized the button immediately since my mom had an identical one she'd been wearing the last couple of days, so I tried pointing to his button and pointing to where it would have been on my chest--it was more clear where I was pointing when I pointed at the location on myself--then back at him again. The best I could manage for "Happy birthday!" He didn't seem to get what I was trying to communicate, but he mom behind him did because I saw her nodding and telling him something. I imagined it was, "He's wishing you a happy birthday!" The boy said something--I couldn't hear what, obviously--but I saw his mom encouraging him to wave. I imagined she was telling him something like, "He can't hear you. You have to wave!" When Amanda was nearby and I saw a shark coming my way, I tried to communicate to her to get a picture of the shark swimming by me. A lot of pointing at the shark and trying to pantomime taking photos. It worked! Actually, I was kind of surprised at how well I could communicate with others on the other side of the glass. All-in-all, it was a heck of a lot of fun! Eventually, I heard a distinct CLINK-CLINK! in the water--our signal that the dive was over. I waved goodbye one last time and everyone moved towards a single large group at the middle of the tank where we slowly rose back to the surface and left the water. Now that I had much better idea about the layout of the tank and realized we were immediately above the central room in the aquarium. Amanda and my mom might be directly below me, not even 20 feet away. But it was like night and day. Front stage and back stage. We took off all our gear and headed back to the locker rooms. Again, they took us through the visitor area to get to the locker rooms, so once again we paraded through the front-of-house in our wetsuits, this time dripping wet. We passed another group of people in dry wetsuits, heading out to make their own dives. "Don't do it!" I joked at one of them, "There's sharks in the water! I barely made it out alive!" Surprisingly, walking around dripping wet didn't actually get us as much attention as you might think. I hoped Amanda and my mom were still there nearby, to get a photo of me in the wet suit without the thick glass or water distortions from when I was actually swimming, but I didn't see them. They might have still been there, but not readily visible on our transit through the front-stage area. Back at the locker rooms, we could change out of the wet suits and shower off all the salt water. We dried off, put our street clothes back and, and were directed once again to the briefing room. We had to wait a bit for the video they took of us underwater to be completed, but soon it was done and they played it for us. The video was.... *shrug* I wasn't especially interested in it. I didn't actually see myself in it at all. Maybe a small blip in the background, but somehow I didn't really make it into the video. And most of it was kind of boring with divers waving at loved ones on the other side of the glass. The video cost money for anyone who wanted to buy it--the proceeds of which were donated to some sort of organization for wildlife protection. (As, I might add, was the cost of the dive trip. Apparently, Disney doesn't keep any of the money for itself.) But I just couldn't stomach the idea of buying a video I really didn't want, even if it was for a good cause and was one of the few people not to purchase it. Returning back to the land of air-breathing creatures. After that was done, we were led back to the front stage area where we could leave and go off to whatever else it was we wanted to do at Epcot. I was about to pull out my phone to call my mom and Amanda and find out where they were located, but they were still there and found me before I even fumbled it back on. 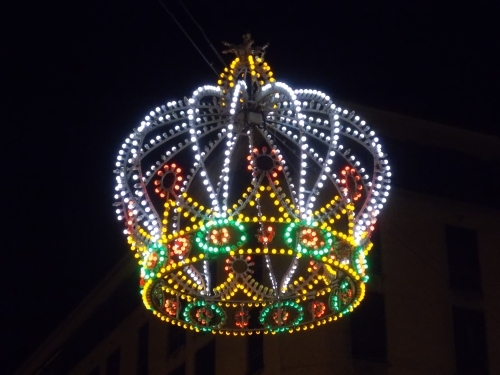 I was surprised when we stepped out of the building and it was completely dark outside. When I entered the building a couple of hours earlier, it was bright daylight. Inside the aquarium, there are no windows or anything else to give you a clue about what's outside. But it wasn't super late or anything--maybe 6:30 or 7:00 or so? And when I stepped outside, I was slightly taken aback at it being completely dark outside. How long was I really in that building for?! Amanda said I did great--it was as if I were auditioning or something with my flips and interacting with all the children. Apparently, I was much more entertaining to watch than the other divers--who I actually paid very little attention to unless they were directly below me and their bubbles were floating up towards me. And... I have some sad news for you folks. This was it. I have nothing more to blog about. After over a solid year of non-stop posts every Monday, Wednesday and Friday, my blog has finally caught up with real life and I have no new material to post. This is it! Come Monday, there will be no new post. Next Wednesday, no new post. Nor Friday. Nor the Monday after that. This is it. The Last Post. 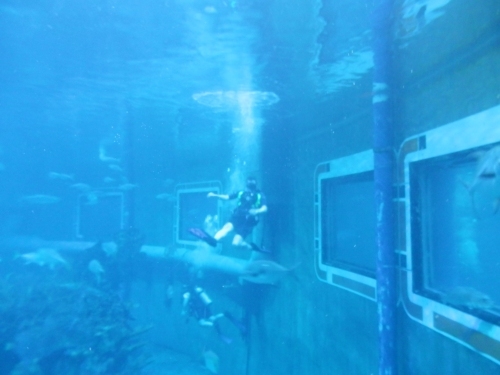 Proof positive that I really swam with the sharks! 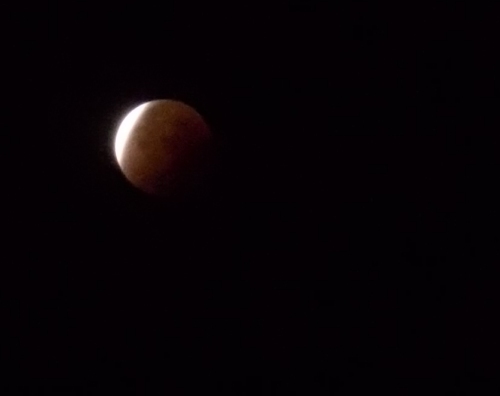 September 28: I woke up Karolina at 5:00 in the morning for a special astronomical event: a total lunar eclipse. I knew there was an eclipse scheduled to happen soon, but being in Europe threw me off a bit because my Astronomy magazine was based on US dates and times as well as news sources I normally read. Most of my friends and family would be able to see it the evening of the 27th, but I was flying through time and space nine hours into the future. Six hours if you consider it from east coast time. My Astronomy magazine didn't say anything about what time the eclipse would be in France, but eventually I figured out that totality would happen--probably--around 5:30 in the morning. So by around 5:00, Karolina and I woke up to check it out. We didn't know exactly where the moon was going to be at 5:00, but it might require leaving the hotel in order to see it. 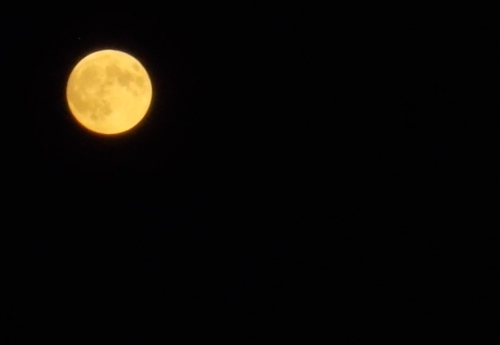 We figured it was almost certain that we'd have to get out to see it since our hotel was facing east and by 5:00 AM, I figured the full moon would be mostly towards the west. Through the hotel window, as expected, we saw no hint of the moon. The stairwell of the hotel was on the west side of the building, so I tried that next--somewhat surprised when I actually did find the moon. Although it was facing the correct direction, I had expected other buildings to block any views in that direction. Which they did--but the moon was still high enough to peek above the buildings. That was certainly convenient! We were all of about 10 seconds walk from the room! Totality hadn't started yet, leaving a sliver of moon exposed to the full onslaught from the sun, and we waited in the darkened stairwell until the whole moon turned blood red. Not surprisingly, I had a devil of a time getting photos. It was just too dark for my camera in unsteady hands. My best photos were actually just before totality when enough light still reflected off the sun that my camera had an easier time getting photos. Karolina went back to the room shortly after totality started, but I hung out a bit longer and eventually returned a half hour later. 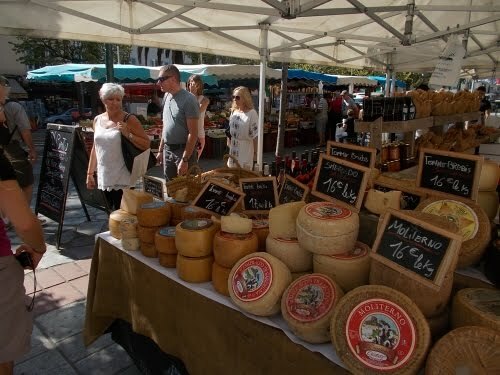 Cheese at an outdoor market. Lots and lots of cheese! I didn't sleep particularly well after that--I was too keyed up and awake now. I tossed and turned until 8:00 when we finally got up again to get breakfast downstairs. Afterwards, we packed our bags. I had to juggle some items around separating stuff I'd carry onto the plane in my pack and the stuff I'd have to check in a small, lightweight bag I had sewed. 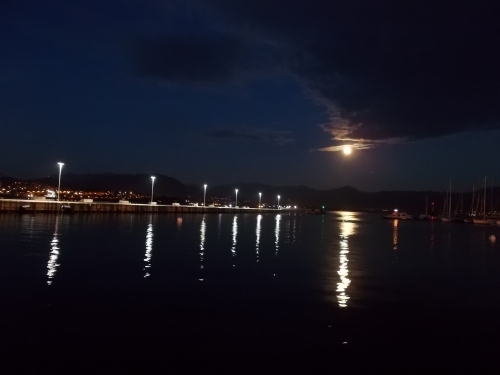 Although we checked out of the hotel early in the morning, we left our bags at the hotel in a small room set off from the breakfast room to allow us to wonder around Ajaccio a bit more before we needed to be at the airport for our flights. I can't say we did anything particularly interesting or exciting after that. I stopped in a bookstore hoping to find Nancy Drew books in French for Amanda, but failed miserably. (Sorry, Amanda!) I had purchased some postcards yesterday and even wrote most of them out already, but being a Sunday, I wasn't able to buy postage for them so I took care of that today. Karolina shopped for lunch by wandering through an outdoor market, which she wanted to eat on the beach where we'd been swimming the day before. 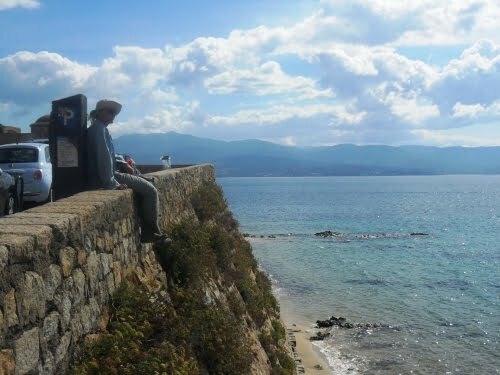 I didn't want to walk out on the beach and get my socks and shoes dirty with sand, so I took a seat on the wall overlooking the beach and ate food I had purchased from the supermarket the day before. Karolina's flight out from Corsica was scheduled to leave a couple of hours before mine. She'd be flying to Amsterdam (via Nice, if I recall correctly? ), while I'd have flying to the United States via Paris. But we headed to the airport together because why not? 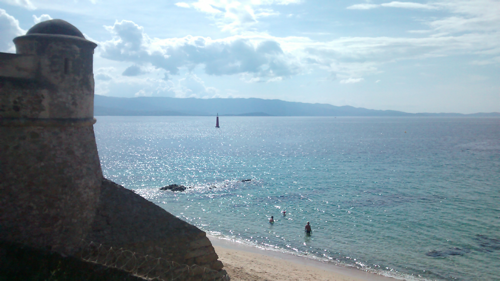 It's not like I had anything better to do in Ajaccio for another hour or two. At the airport, I tried to check in but they wouldn't let me drop off my bag more than an hour before the flight. A mere hour?! Karolina had her own troubles checking in for her flight. The kiosk where we could check ourselves in was showing an incorrect destination. We eventually went to a counter where a real live person checked her in--or rather, told her to wait to the side until someone else came to help her. As it turned out, her flight was running late meaning that she'd be missing her connecting flight in Nice, so they were now going to send her through some other city and rebook her to Amsterdam. She'd be getting into Amsterdam a few hours later than originally scheduled, but she'd get there eventually. "You'll still get home before I will!" I told her. I was taking a flight to Paris, but I'd have to spend the night in Paris before I would be able to catch my next flight on to the United States and--even worse--depending on flights and loads, I might then have to spend the next night in Phoenix. I might be living at airports for the next two days! I ate lunch sitting on this high wall overlooking the beach. Once Karolina's tickets were straightened out, we hugged each other goodbye and she left through security, never to be seen again. Or so I thought.... I was finally able to check my bag about a half hour later and entered through security myself where I found Karolina, still waiting for her flight. It was still running late! My flight left about 40 minutes after that. I love airports without jetways because they boarded the flight from both the front and rear doors of the plane getting it boarded in half the time it would usually require with a jetway. My seat was on the front half of the plane so I boarded through the front door. I just had to be careful not to fall off the wall. 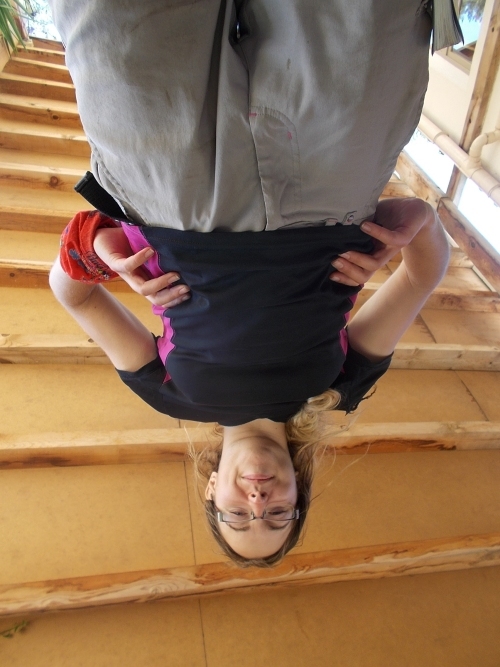 It was a long way down if I did! The plane soon took off over the Mediterranean Sea. I had great views at my window seat for all of about five minutes before the plane rose through a layer of clouds obscuring the views below. A couple of hours later, the flight landed in Paris. I looked out for the Eiffel Tower and other famous landmarks, which I did manage to catch sight of briefly before landing. Can't say it was particularly amazing from my distant viewpoint, though. The plane landed at the Orly airport, an airport I'd never been to before and--even worse--not the airport where my flight to the United States would leave from. I picked up my checked bag, then found the bus stop for the bus that would take me direct from Orly to the Charles De Gaulle Airport, practically on the other side of Paris. When I got on the bus, the driver asked which terminal I wanted to get off at, but I didn't know. "Wherever US Airways is located," I answered. But the bus driver didn't know that. I'd figure a bus driver who regularly drove this route ought to know something like that--or at least have a chart with all of the airlines and which terminals each of them use--but not this one. I paid the fair anyhow and I got on the bus, with neither the driver nor myself entirely sure which stop I should get off at. I figured once I was at the airport, there was probably some shuttle that could take me to another terminal there if I somehow ended up at the wrong one. 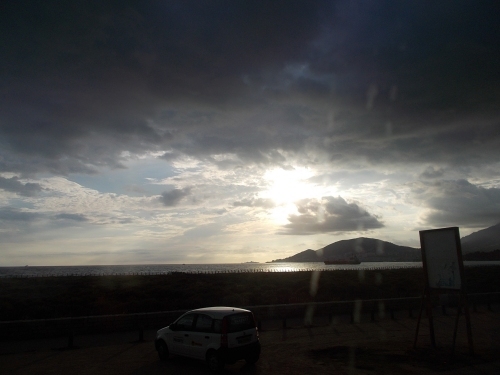 The bus finally dropped me off near sunset--and a rather spectacular one at that with brilliant red and orange clouds dominated the sky--and bought a few snacks and dinner at a Relay market and haunted the soon-empty airport for the rest of the night. My flight to the United States wouldn't leave until something like 10:00 the next morning. I had time to kill. 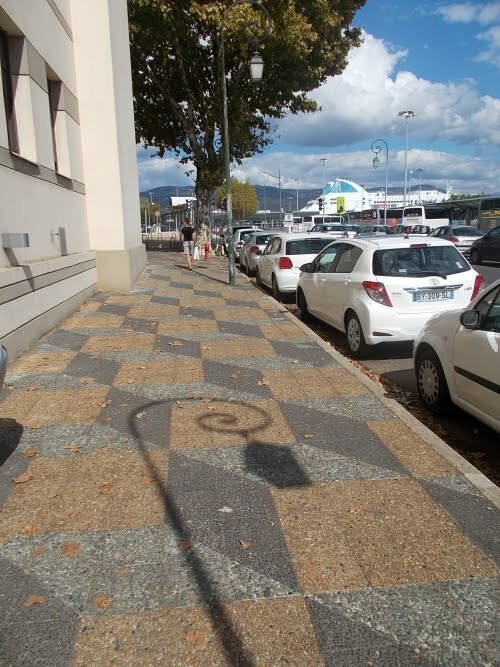 I really liked the shadow of this lamp against this sidewalk! 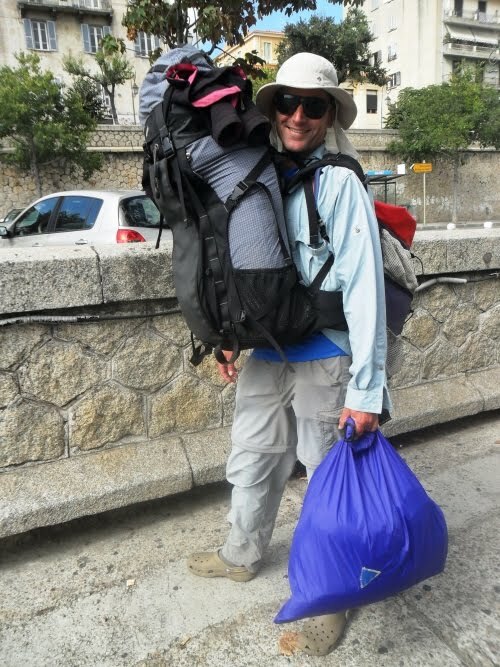 While Karolina was photographing our departure, I carried all of our gear onto the bus. The purplish bug in my hand is the one I sewed myself to check items at the airport. The one on my back is what I'd use for my carry-ons. And the pack on my chest was Karolina's. Don't worry, Amanda--the flight out of Corsica wasn't on your airline. I paid full price for that ticket so I was allowed to look like crap! =) I'd change into nicer clothes and my tie before checking in with US Airways. 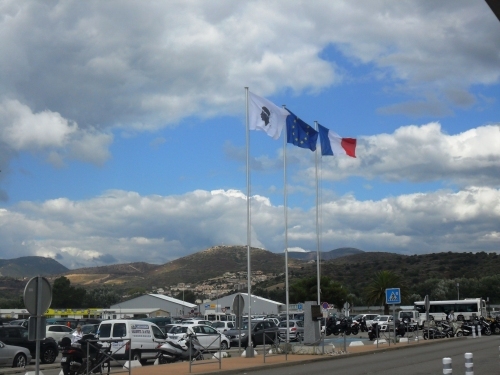 Flags in front of the Napoleon Bonaparte Airport. 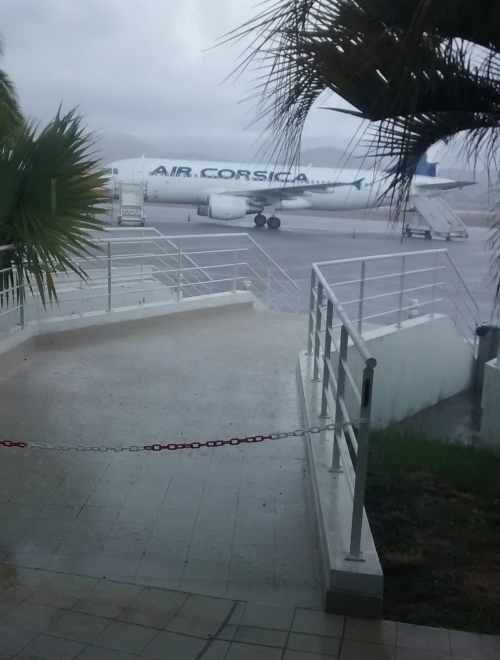 An absolutely torrential downpour hit the airport just before Karolina was about to board her plane. (I'm not 100% certain, but this might have been her plane.) It just looked like sheets of water were hitting the ground! 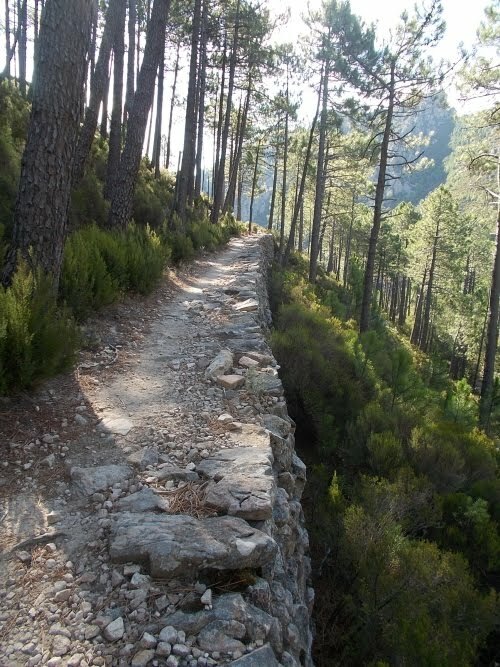 So glad not to be on the trail right then! 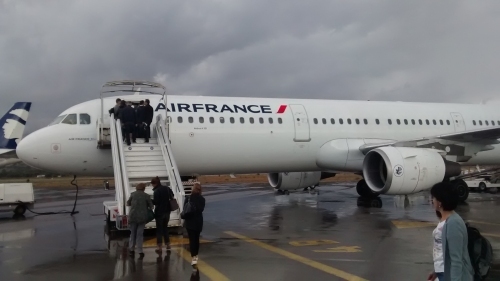 I boarded an Air France flight to Paris's Orly Airport. Fortunately, the rain had stopped by the time I had to board, although the ground was still very much saturated with water. 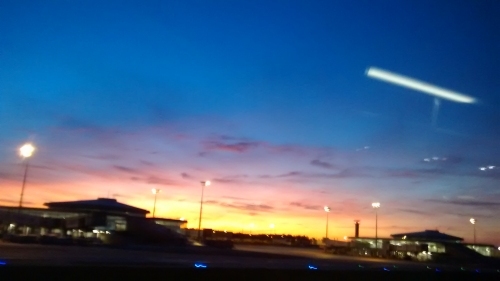 There was a gorgeous sunset going on when I arrived at Charles De Gaulle Airport, but the moving bus meant most of my photos were quite blurry and none of them really captured the colors well. 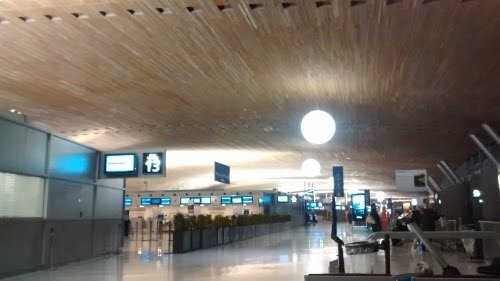 Wandering around the mostly-empty terminals of Charles de Galle all night long.... I was stuck outside of security, though, since I couldn't check in for my flight until late next the morning. The beautiful view out our hotel room window in the morning! 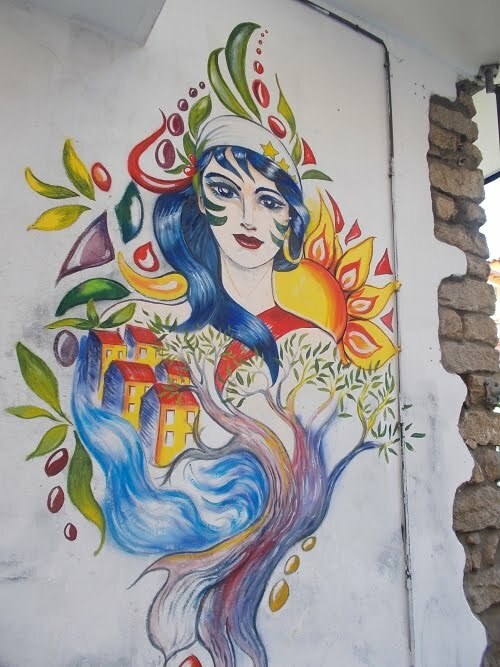 But I still have more to write because I was still in an exotic, foreign country and although I wasn't hiking, there's still more to share! Both Karolina and I scheduled our flights to leave Corsica tomorrow, so we had all day to explore the largest city in Corsica, the capital of Corsica, and the birthplace of Napoleon--information that the whole city beats you over the head with from naming their local airport the Napoleon Bonaparte Airport to statues of the man to postcards of him. 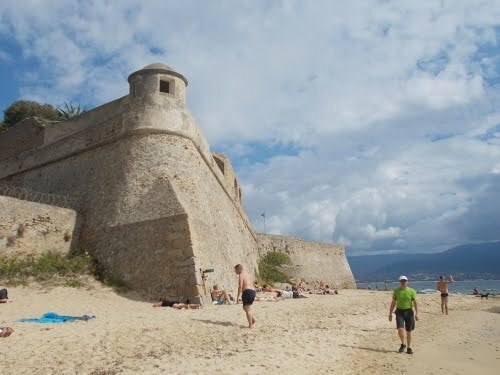 The people of Ajaccio clearly take a great deal of pride that Napoleon was born here, although from everything I read, he never did a thing for Corsica after his rise to power. But anyhow, with no rush to get miles under our feet, Karolina and I slept in late. Or rather, laid around surfing the web on our smart phones. I had so many emails and messages to catch up on.... the 16 days I was offline might have been the single longest time I'd ever been offline since I first connected to the Internet! What I really wanted was my laptop--there's only so much I can do from a smartphone--but I had shipped my laptop home from Milan. As much as I wanted it now, I'm certainly glad I didn't carry that heavy thing on the GR 20. I had made the right call sending it home. But it left me with no Internet access except for what I could do on my smartphone. The hotel included a continental breakfast, so eventually we got up to to catch that before they closed it down for the day. Throughout this whole trip, I was stunned at the amount of food Karolina could put away, probably double the amount I could eat. She must have gone back for more food a dozen times, then jokingly "fought the toilet monster" to make room for more. Honestly, I don't know how she does it. She puts thru-hikers to shame! 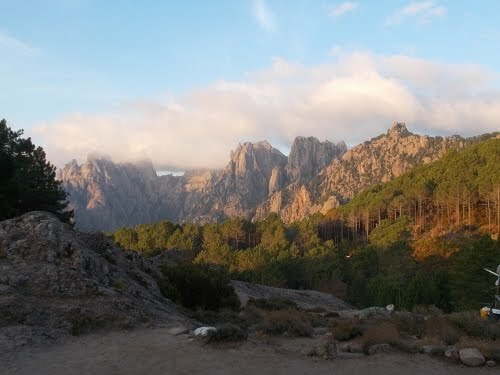 Then we walked around town a bit, taking photos and admiring the views. 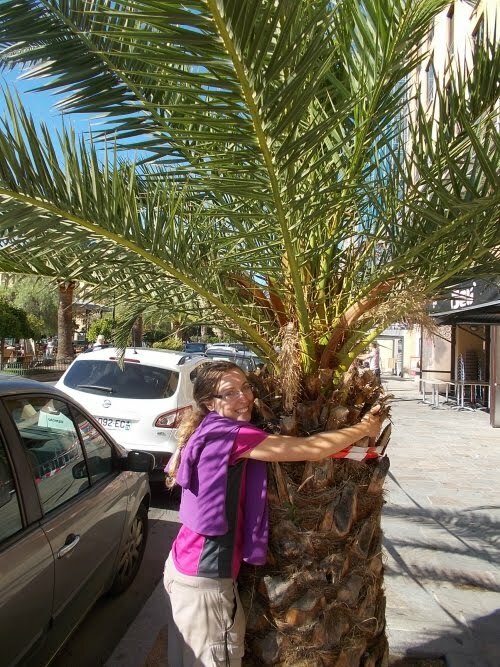 Karolina was fascinated with every palm tree we would pass, like it was some strange plant from an alien world. Apparently, they don't have any palm trees in Poland or the Netherlands. 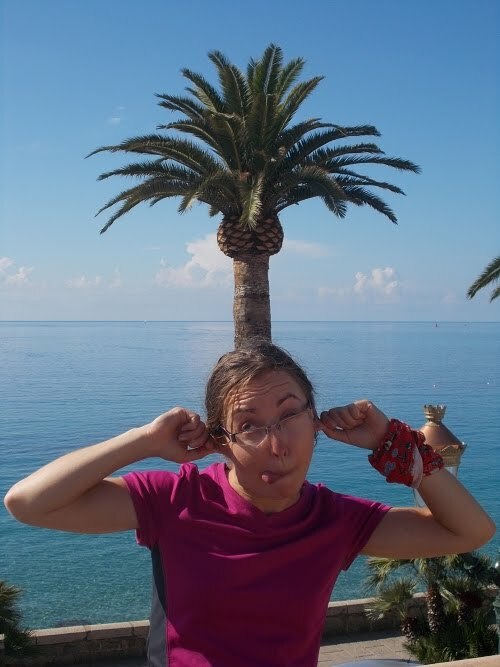 Karolina couldn't pull herself away from every palm tree that we'd pass! 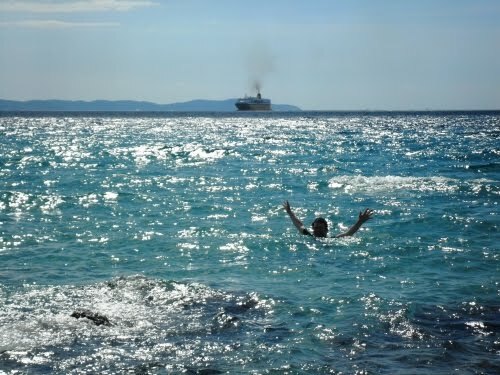 Karolina was anxious to swim in the Mediterranean Sea--something she had never done before. I hadn't either, in fact, but it just looked like another body of water to me. But she didn't have a swimsuit so we wandered around some shops for her to find an outfit she could swim in, eventually settling on a cute little dress that cost a mere five euros. It wasn't a swimsuit, strictly speaking, but it was lightweight and would probably dry quickly. The short skirt did tend to flap in the wind and water like a smaller version of Marilyn Monroe's dress. We also stopped at the supermarket to buy some food and snacks for the afternoon. A lot of the stores appeared to be closed because it was Sunday. Sunday could be problematic in that regard. 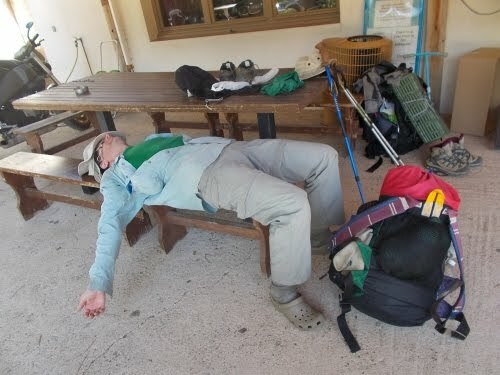 We had pushed hard to finish the GR 20 the day before because we weren't sure that buses would even be running on Sundays. 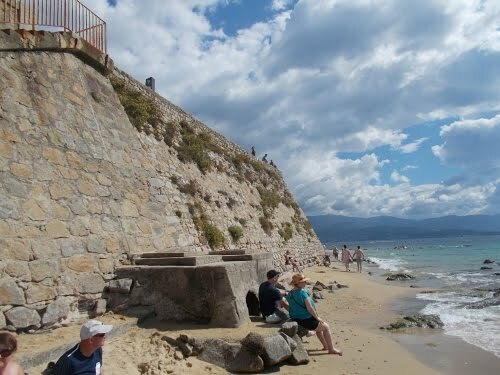 I'm still not sure of the Sunday bus route, but a lot of Ajaccio was certainly closed for the day. 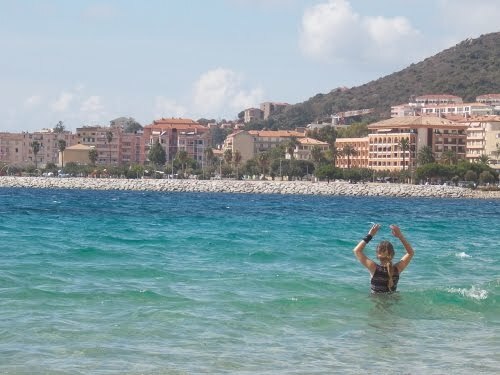 Once Karolina had her new "swimsuit," we headed to the beach where we took turns swimming in the great Mediterranean Sea. I jokingly warned to to "watch out for sharks," and she told me that there weren't any. I sat down on the beach and watched all of our gear while Karolina took the first dip in the sea. 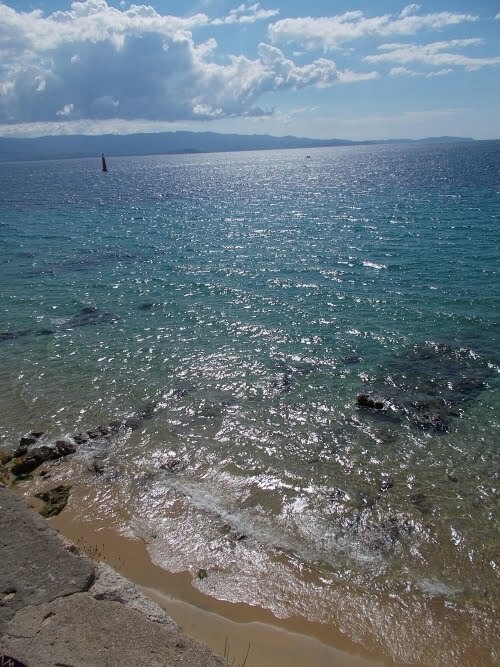 Her observations included that the sea was much warmer than anything else she had ever swam in (but the waters of the Baltic Sea aren't known for being warm either), and much saltier than the Baltic Sea. I waded out into the water, which was.... cold. Not super cold, mind you, but cold enough that it feels uncomfortably cold upon first contact. After 10 or 15 seconds, it doesn't feel so cold anymore and is quite comfortable. It went pretty well wading into the water up until the water level reached my torso when I knew I'd just be torturing myself by continuing to slowly wade deeper into the water, so I just plunged in the rest of the way. Ahhh! Cold!!!! And about 10 seconds later, I could breathe again and all was well. And not a shark to be seen for as far as the eye could see! Later in the afternoon, Karolina and I tried to book a sunset cruise. Dress up a bit and act like the classy people that we clearly were not. =) I had a tie and a nice, collared shirt to look presentable while flying, so I dressed up in those. There were lots of kiosks for sunset cruises in town, but they all turned out to be closed. So, no sunset cruise for us! Instead, we decided to do laundry. It was just as well we missed the cruise, though, because later in the evening there was rain, lightning and thunder. A small boat was probably not the best place to be in such conditions. And long after dark, we headed back to the hotel. 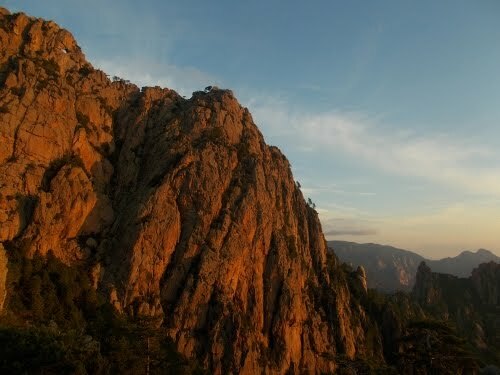 Our last full day in Corsica was officially over! Cruise ships dock at Ajaccio, and Karolina wanted to take a photo wearing her new dress like she was a celebrity passenger that had just stepped off of it. 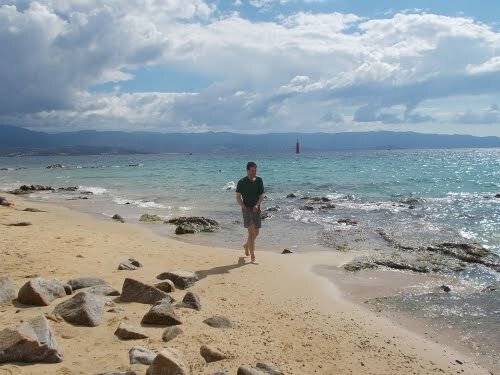 That's me, returning from my own first dip in the Mediterranean. 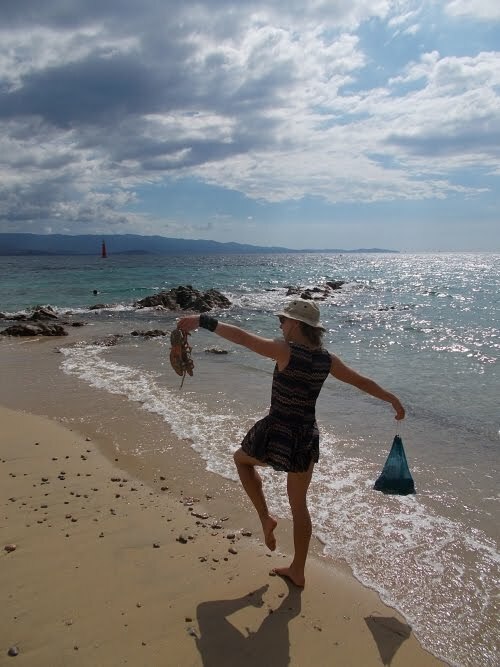 Karolina captured this video of a rare sea monster coming out of the Mediterranean! 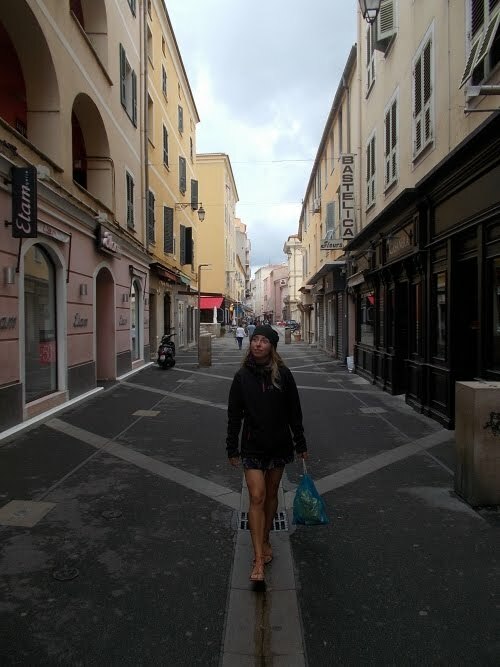 Here I was trying to get an "artistic photo" of Karolina walking the streets of Ajaccio. I really liked the pattern that the water drains on the street made! It's a Sunday afternoon, though, so everything was closed and few people were out! 'Twas a full moon.... and if weather cooperated, we might even see a total lunar eclipse at 4:00 or so the next morning! 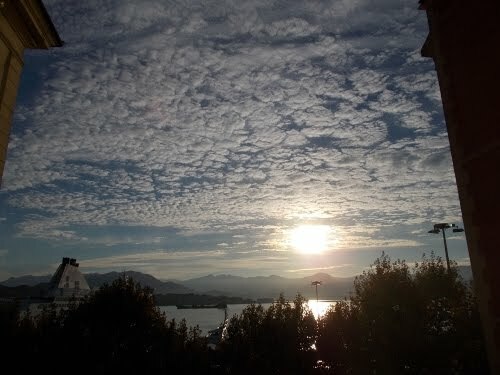 It was a beautiful sunrise! 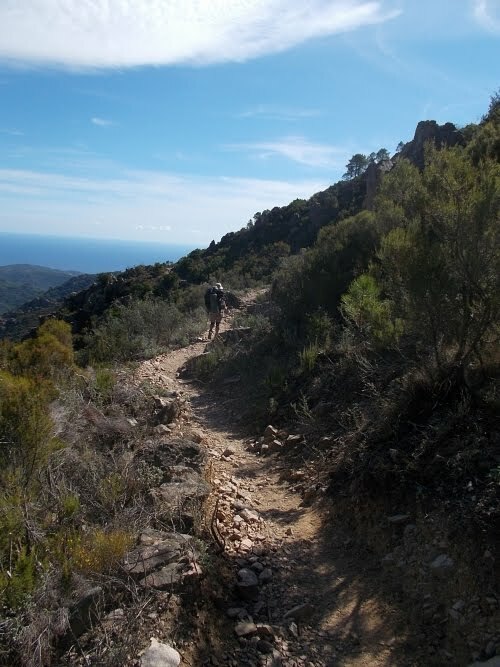 The trail was fairly easy the whole day, mostly consisting of a slow and steady descent to lower and lower elevations as we neared the Mediterranean coast. Karolina had run out of snacks and positively blazed down the trail--so much so that I often had times keeping up with her. She was in her element and a woman on a mission! 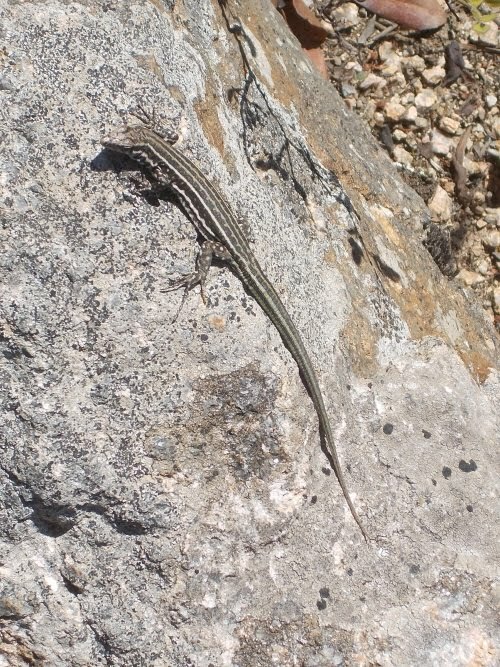 As the elevation dropped and temperatures warmed considerably, we started seeing notable changes in the vegetation and even insects along the trail. Although the trail was wonderfully nice and flat for walking, rough terrain poked through the vegetation that reminded me of pictures I'd of southwest Asia. 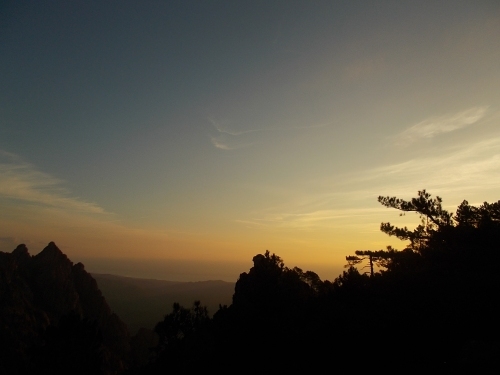 Or perhaps an alien planet. Or a time when dinosaurs ruled the earth. It was a magical sight! And then Karolina saw a cactus--a genuine, honest-to-goodness cactus!--and her head promptly exploded. Okay, maybe not literally, but this was very exciting for her as she reminded me that in Poland and the Netherlands, there were no cactus. 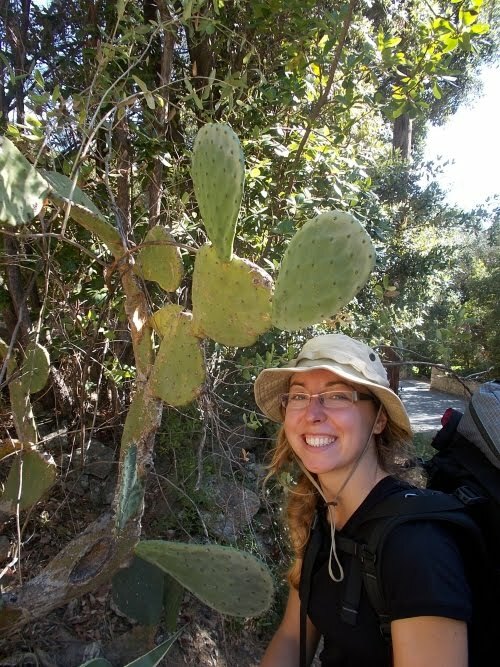 She'd seen some before during her Camino hike years earlier, but cactus were still a strange and bizarre novelty for her and she was quite excited about seeing them, having to have her photo taken with them. I had my own case of giddiness when near the end of the trail, we crossed paths with the first cork tree I'd ever seen. I'm not sure I'd have noticed it if Karolina hadn't pointed it out to me--from a distance, it looked like just another tree, but close up, the bark was entirely make of cork. I knew cork came from trees, but it was still bizarre for me to see. 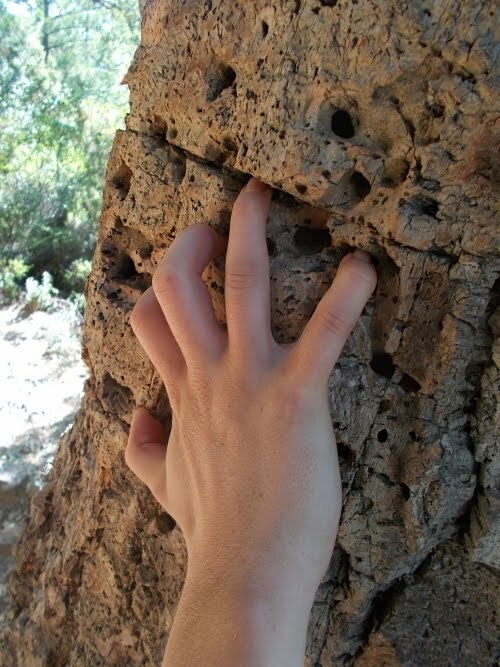 I touched it, and it felt spongy-ish like cork. I knocked on it a bit, and it was the softest bark I'd ever felt on a tree. It didn't seem real. 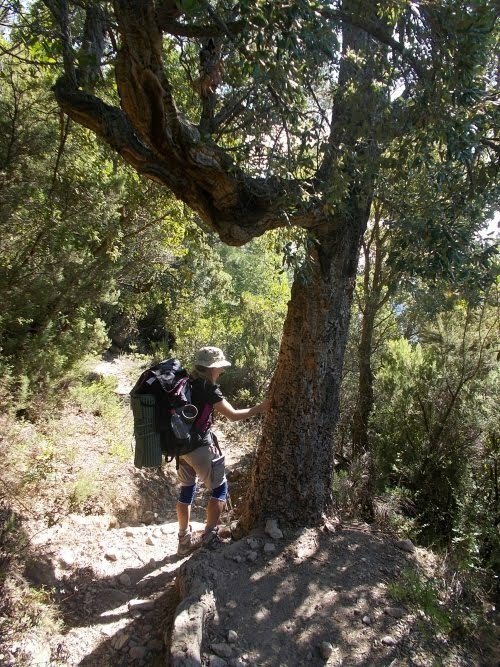 I had no idea cork trees even grew in Corsica! 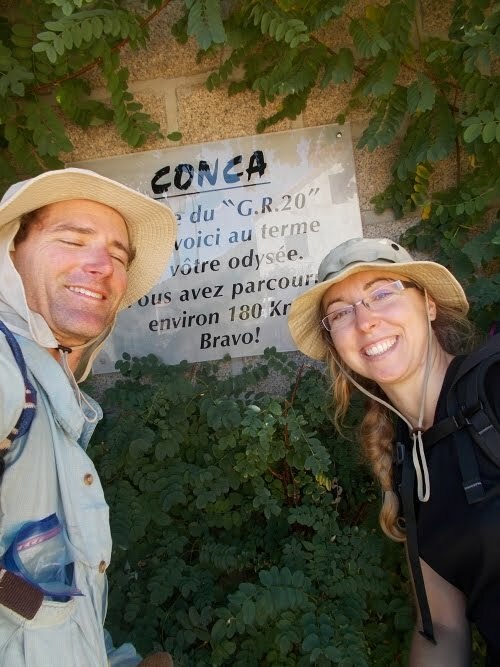 And perhaps a half hour later, we were at the end of the trail in Conca! We found a plaque marking the end of the trail on the side of the building, so this made it official. We were done! 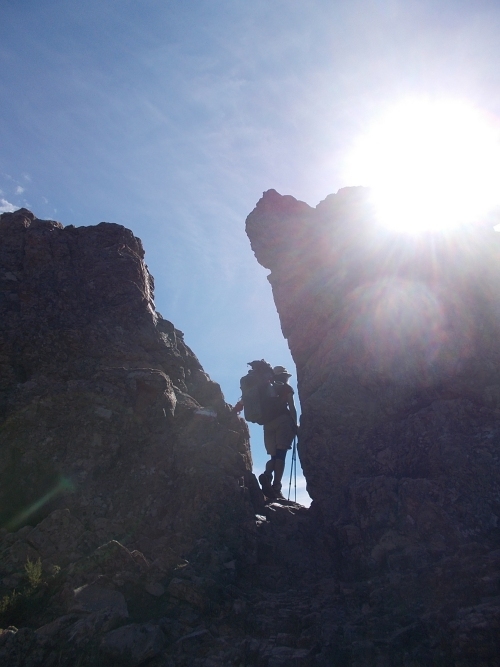 We'd arrived by noon--which was actually quite remarkably since we had covered a whopping 14 kilometers. By noon! Usually it took us until the end of the day to cover that much mileage. 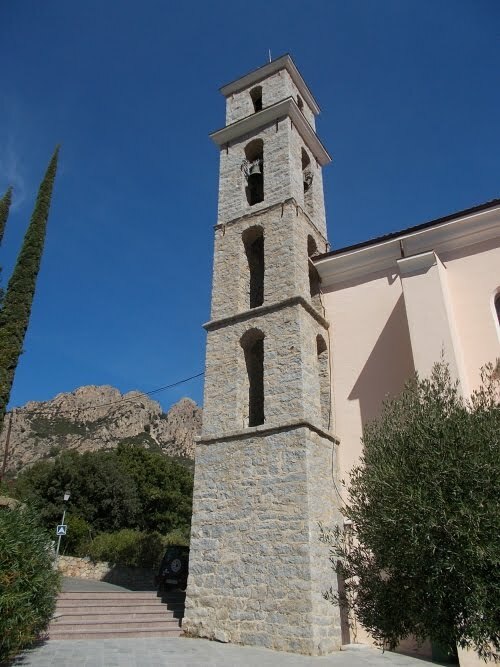 A bit further into town, we stopped at a small restaurant where we made reservations for the next shuttle to Porto-Vecchio at 2:00, which gave us over an hour or lounge around and rest. That drained our little amount of cash by 8 euros each. 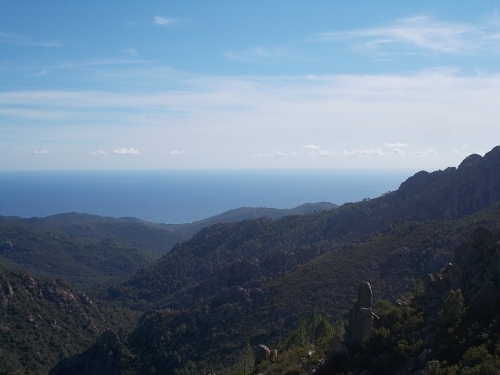 At the expected time, we piled into a mini-van with several other hikers getting off the trail which then deposited us in Porto-Vecchio. This town was big enough that it probably had an ATM--which I was desperately on the lookout for. I still had 20 euros in my pocket--Karolina had been picking up my tab--but I was already in debt to her by more than that amount. As far as I was concerned, my personal finances were actually in the negative at this point. I needed an ATM to pay back Karolina and fund the rest of this trip! But we didn't have time for an ATM stop because precisely where the shuttle dropped us off we saw a bus with the word "Ajaccio" written on it--our ultimate destination. 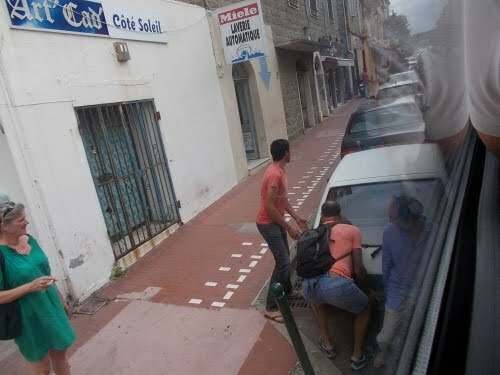 If that bus was going to Ajaccio, we wanted to be on it! 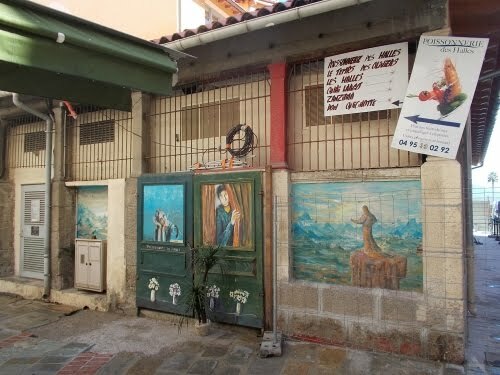 We didn't know anything about how often the bus to Ajaccio ran, where the stop was located in town, or pretty much anything. 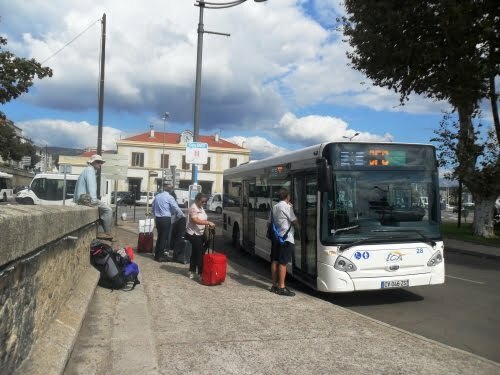 It was mostly a fortuitous accident that we wound up at this bus just as it was ready to head to Ajaccio! Actually, it probably wasn't an accident. 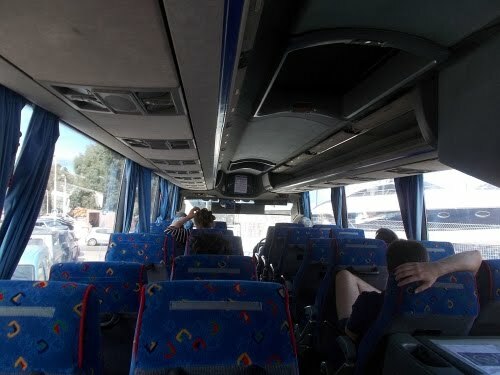 I suspect the shuttle was timed with the buses leaving Porto-Vecchio. 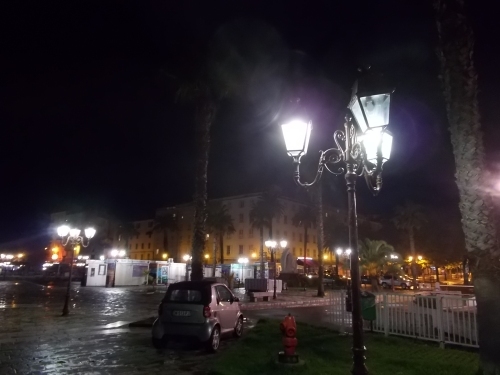 Anyhow, we wanted to be on the first bus out of here, and if it was just about to leave town, we didn't have time to look around for an ATM or anything else for that matter. 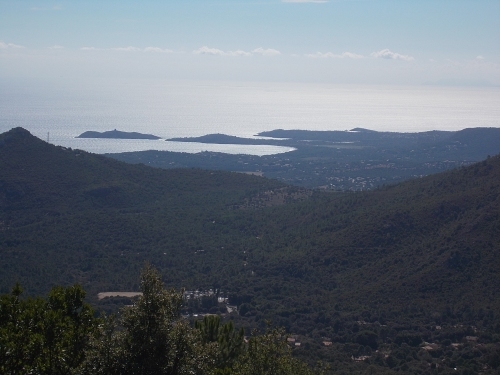 Karolina talked to the driver in French, learning that it was indeed heading directly to Ajaccio and it would cost another 20 euros each to get us there. Karolina paid the fair, and we got on the bus. We had no idea how long the bus ride would be. 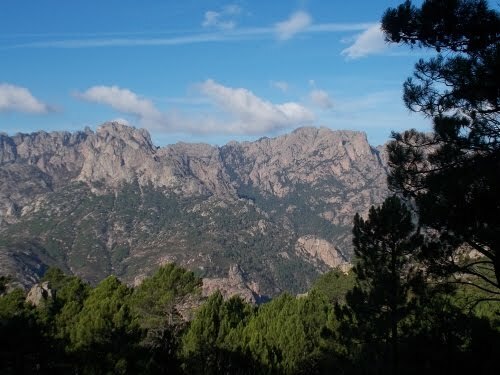 Corsica isn't a big island, but it also didn't have major interstate highways with long, straight freeways either. Karolina asked where on the bus I wanted to sit, and I answered her anywhere on the left side of the bus. Which she thought was an unusual request. Why the left side? What was wrong with the right side? 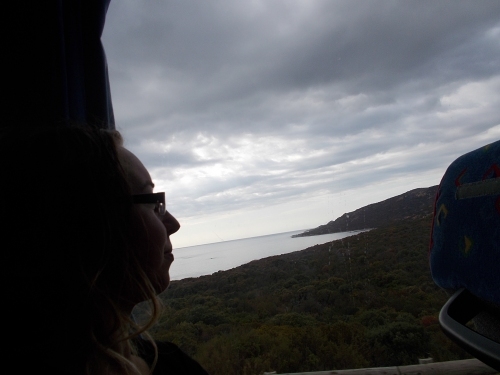 I knew the bus would largely be following the coast to Ajaccio, and I wanted views of the Mediterranean Sea which I would would be off to the right. 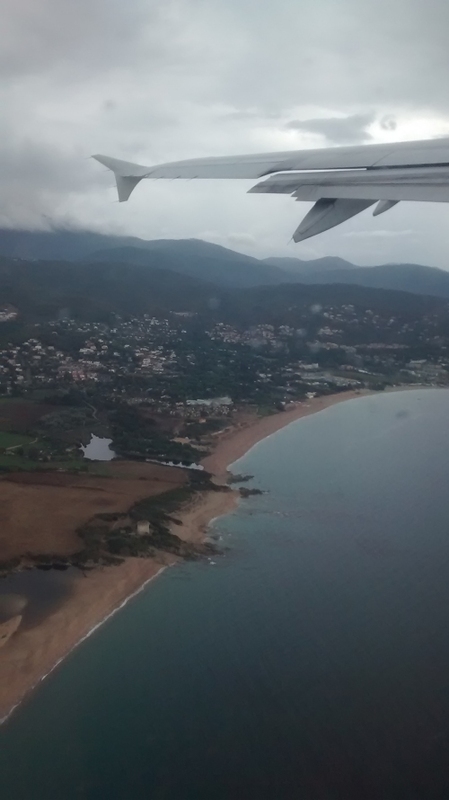 Three hours later, we arrived in Ajaccio--the capital of Corsica and the birthplace of Napoleon Bonaparte which is their biggest claim to fame. When we arrived, it was dusk and although it wasn't dark--yet--it was heading in that direction quickly. We still had no lodging, little cash, and we didn't even have a map for the city which would have been useful seeing as neither of us had ever been there before. But we did see a sign pointing to a tourist office, so we decided to follow that first. We weren't optimistic that it would actually be open--it was already a bit after 6:00 in the evening and in our experiences, those tourists offices often have very limited hours. Being open on a Saturday evening seemed like too much to hope for, but at the very least it'll let us walk around a bit and get an idea of what was located in the area. Maybe pass a hotel or two along the way. Miraculously, the tourist office was actually open! We couldn't believe our luck! We got a map of the city, directions to an ATM machine and grocery store, and directions to the cheapest hotels--the Dolphin being our best bet. 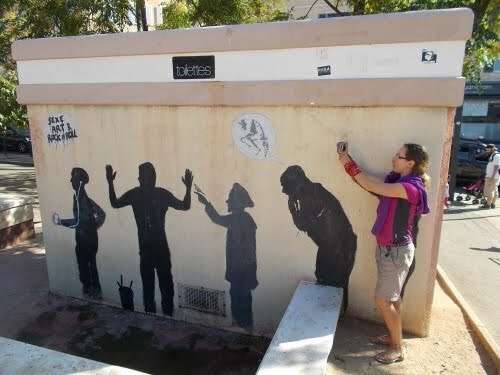 Then we took turns showering off 16 days of dirt and grime from ourselves. I let Karolina use the shower first and I tried to get onto the wi-fi connection with my smartphone to let Amanda and my mom know that I had finished the trail and was once again in civilization. It would be the first time either of them had heard from me since I left Milan over two weeks ago! I had a heck of a lot of email to catch up on, which I started going through on my smartphone until Karolina finished her shower at which point it was my turn to clean up. 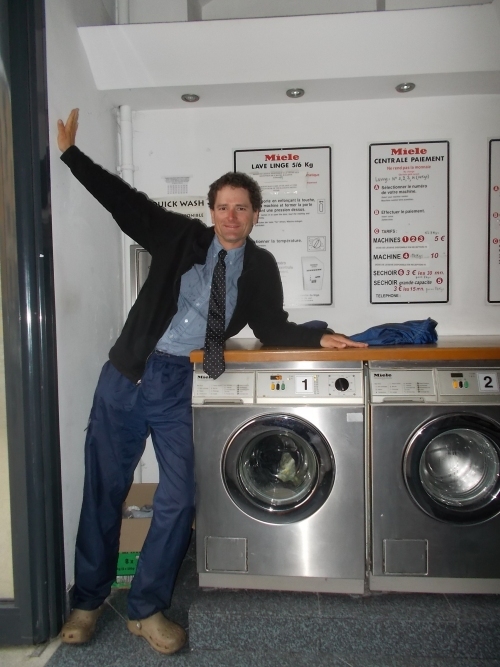 My body was now clean, but we still had no clean clothes. Laundry was definitely on our to-do list, but for the meantime, I put on my camp clothes. 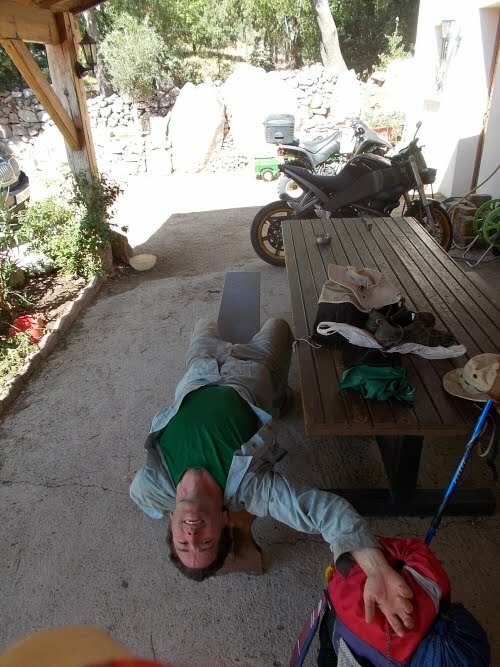 They were dirty, but nowhere near as dirty as the clothes I'd been hiking in every day for two weeks. It was now dark outside, but that didn't stop us from going out. We both wanted dinner (and none of the crap from our backpacks! ), so we headed to a restaurant where I ordered the second best burger in Europe. I really wanted to a hamburger, and most of my experiences with hamburgers in Europe tend to be a huge disappointment, but I was going to give it another try and was remarkably surprised at how good it was. Very un-European-like (which is a compliment to the hamburger--not so much for Europe, I suppose). 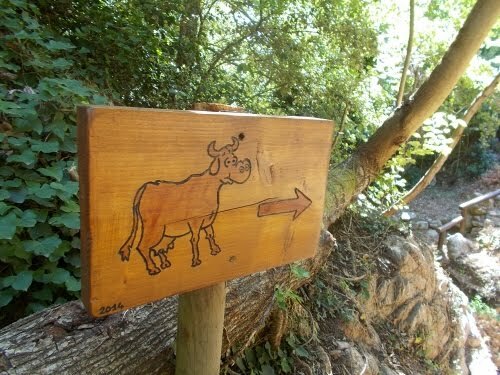 But still, there was that one hamburger I ate on the Camino in France that I'd still rank as better than this one. But still... it was good! 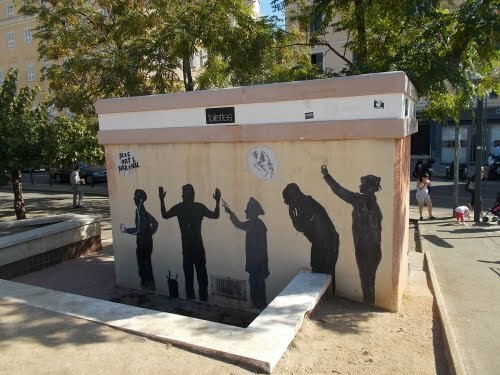 We also hit the ATM, where I picked up 200 euros. I didn't expect to need even half that amount--especially now that I was in civilization where I could just put charges on my credit card--but after running out of money on the trail, I didn't want to take anymore chances. Anyhow, it seems like I end up in Europe at least once every year or two. If I had extra at the end of the trip, I'd use it eventually! 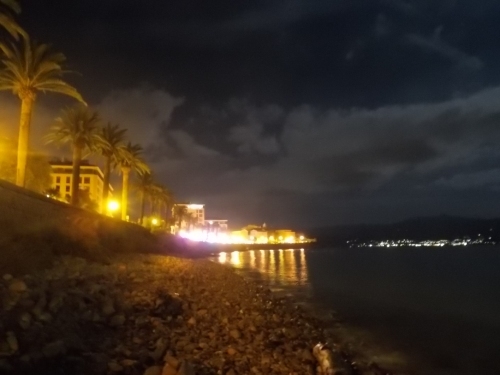 We walked down to the waterfront after dinner, where I touched the Mediterranean Sea for the first time, and it touched me back. =) I also spotted a large rat or something that ran along the edge of the beech which freaked out Karolina. Giant, holy rats! Late in the evening we finally headed back to the hotel where I surfed the web on my smartphone some more and called it a night. 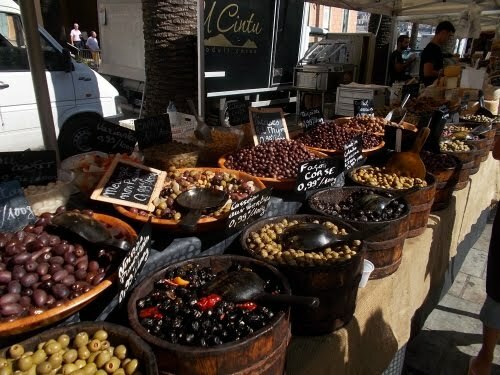 The Mediterranean Sea.... it's getting closer than ever! 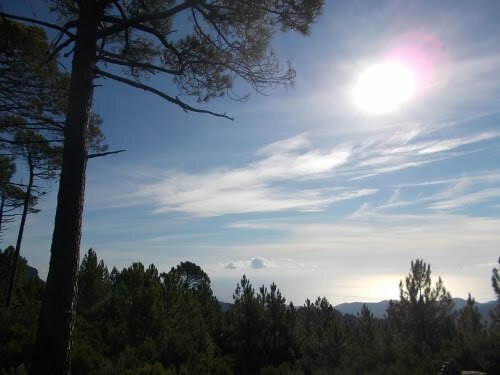 =) We could even see a large island to the south which we assumed was Sardegna (a part of Italy). 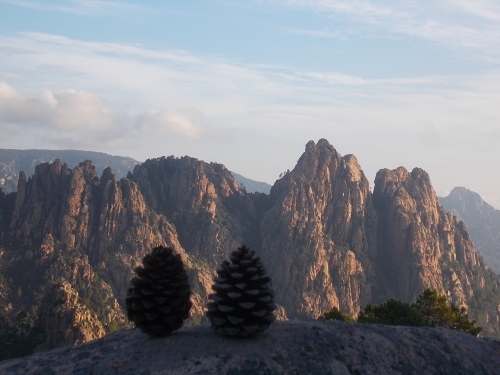 Unfortunately, Sardegna doesn't really show up in my photos. It was a faint, hazy object with the naked eye, but invisible to my camera lens! The end of the trail is near! ...it's a cork tree! It looks like cork, it feels like cord, and it IS cork! 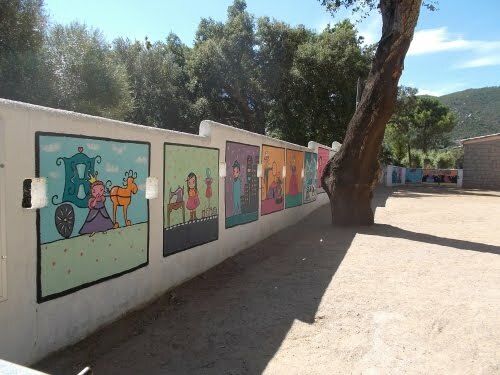 Murals in a school yard in Conca. The plaque officially marking the end of the GR 20. We're done! 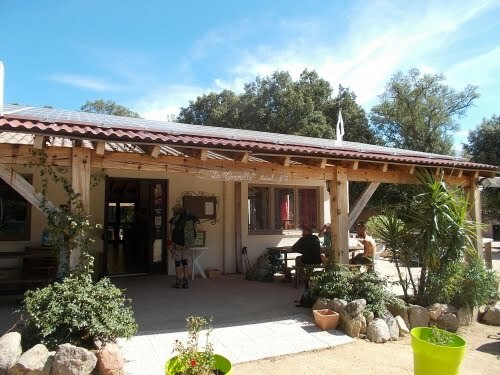 This is the small restaurant where we waited for our shuttle to Porto-Vecchio. 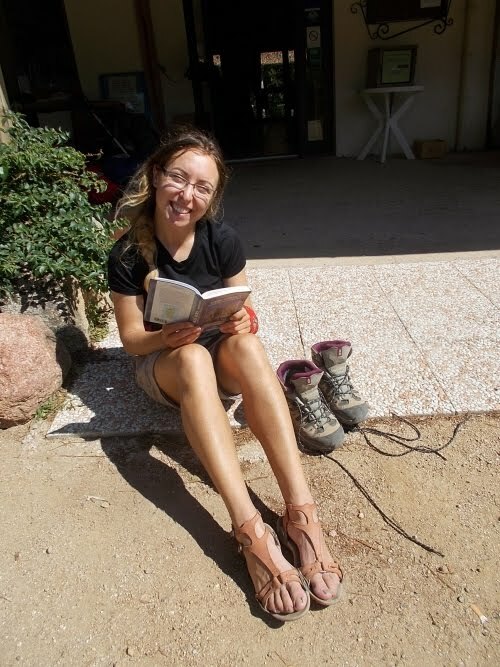 Karolina relaxes by reading her guidebook. 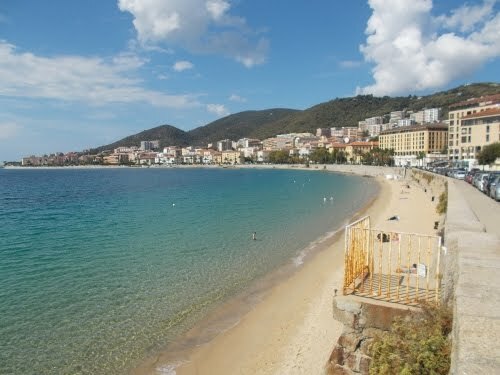 Along the Mediterranean coastline in Ajaccio. Just watch out for the giant rats!